Fierce Festival | Check out Mel Brimfield’s exhibition at Ceri Hands Gallery at new London project space. Check out Mel Brimfield’s exhibition at Ceri Hands Gallery at new London project space. We highly recommend you visit Mel Brimfield’s exhibition at Ceri Hands Gallery, 71 Monmouth Street, Covent Garden, London. The show features collaborations with Dickie Beau, who featured in Fierce 2011 and the forthcoming DIY 9: An artist development programmed by artists for artists. The Project Space and exhibition present a taste of things to come in advance of Ceri Hand Gallery launching a new permanent gallery space in central London later this year. The extraordinary range of Brimfield’s practice is reflected in this exhibition: she selects music, writes and directs the scripts and films, makes all the props and sets, enabling her to fully collaborate with actors, opera singers, photographers, artists and musicians to create the final works. From mainstream and academic approaches to conveying cultural history, the idea of the suffering artist thrives: artists with mental illness, drug addictions and promiscuity problems range from Rothko, Modigliani, to Tony Hancock, Kurt Cobain and Amy Winehouse. Brimfield invites us to reflect on why this myth is so persistent with the potent and much lampooned eroticism of Ovid’s Pygmalion myth at the centre of this new body of work.The title for the exhibition is taken from a trailer for ‘Lust for Life’, a Vincent Van Gogh biopic starring Kirk Douglas. Between Genius and Desire – Jackson (after Ed Harris) and Between Genius and Desire – Vincent (after Kirk Douglas), 2012 are two new films by Brimfield that focus on movies about artists, including Ed Harris’ unintentionally comic turn as a moist-eyed, thick-skulled Jackson Pollock, lumbering dumbly about the studio like an injured bison to the thrum of inexpressible emotion in his Hollywood biopic, and on Kirk Douglas’s tortured gurning in his portrayal of Van Gogh in ‘Lust For Life’. Condensing their performances into fragments of their most emotive monologues, Dickie Beau presents a composite portrait of a ‘great artist’ revealed through a variety of clichés – the emotional register ranges from hysterical and desperate to the ecstatic and violent. Extending the drag tradition of lip-synching, Beau’s complex performances address the construction of gender identity and celebrity personalities. Also presented will be a series of photographs of Dickie Beau performing climactic moments in the lives of Van Gogh and Pollock. Points of the film will be highlighted and re-created as static tableaux, such as Van Gogh cutting his ear off in Vincent (Portrait with Bandaged Ear), 2012 or Pollock posing for Hans Namuth in his studio ‘at work’. 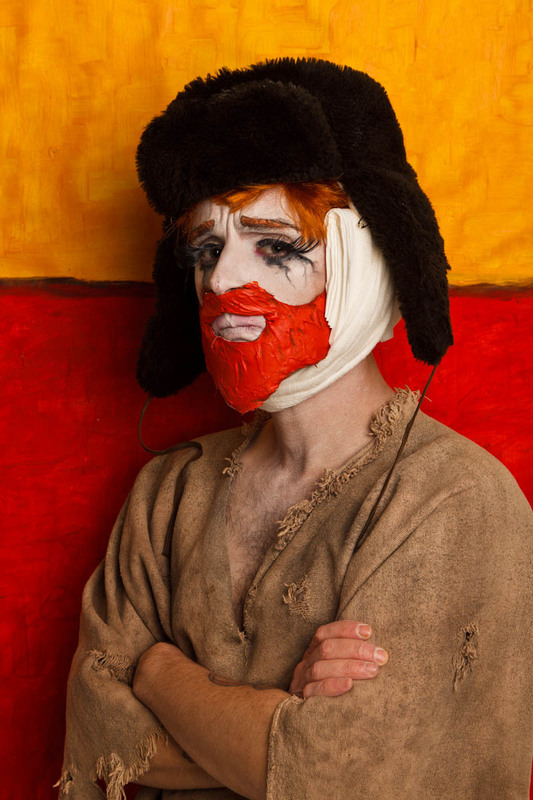 Throughout, Beau will embody the high drama of the Hollywood re-creations of these moments, but in costumes that demonstrate the clownish ‘drag’ of it – his trademark over-drawn red mouth and whited up face will feature throughout with a series of lowend wigs, props and costumes, (with backdrops painted by Brimfield). blatant misogyny and the art world’s complete disinterest in her as anything other than Pollock’s carer. 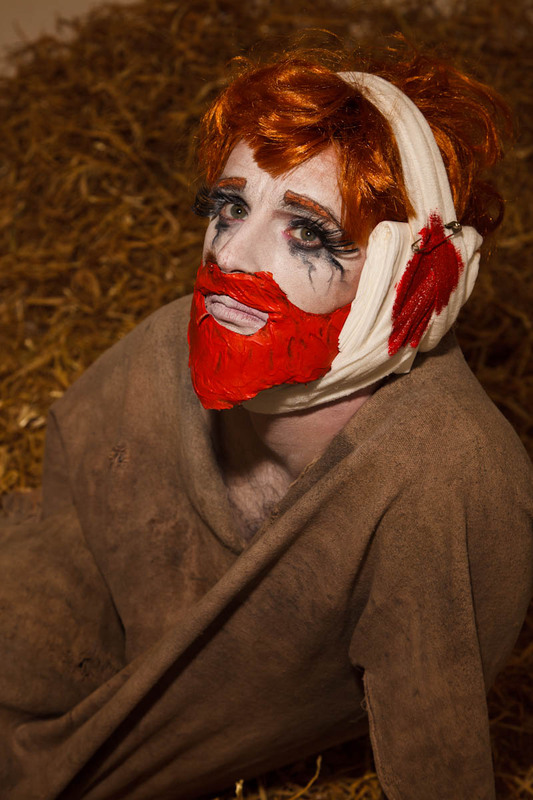 Book signing – 6.30pm, Thursday 12 July, Ceri Hand Gallery Project Space: This is Performance Art – Mel Brimfield. A new monograph on the artist published by Black Dog Publishing will be signed by the artist at the exhibition preview. Artist’s performances – 9pm, Thursday 12 July, Phoenix Arts Club, 104-110 Charing Cross Road, Covent Garden: New performances by gallery artists Mel Brimfield, Bedwyr Williams and Rebecca Lennon followed by after party. Ceri Hand Gallery has relocated from Liverpool to Ceri Hand Gallery Project Space, 71 Monmouth Street, Covent Garden, London, WC2H 9DG in advance of launching a new gallery in central London in late 2012. Opening hours: Tuesday to Saturday 10am – 6pm The exhibition following Mel Brimfield: Between Genius and Desire at Ceri Hand Gallery Project Space will be S Mark Gubb: Third from the Sun, 31 August – 29 September, Preview Thursday 30 August 6.30pm – 8.30pm. Next: Radical exhibition at mac Birmingham aimed at kids by Japanese artists KOSUGE1-16 opens this Sat!